Meet the Grade 12 Drama kids from Western Canada High School. We’re handing over this edition of CdnTimes to them as they finish the school year and build their performance Exploder – a collaboration with Calgary’s Ghost River Theatre. 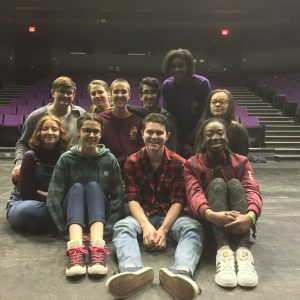 Along with their drama teacher Ms. G, the drama kids from WCHS reflect on what they love, what they’ve learned, and what they look forward to next. The WCHS Drama program is one of Western Alberta’s oldest high school drama programs. The program really began to gain recognition under the amazing and inspired work of Betty Mitchell in the early 1940’s. Betty Mitchell set up a tradition of creating and producing bold, forward-thinking work in what could be (and still is) a conservative city. Graduates of the WCHS drama program have gone on to work in theatres across the country (including SWS’s own Adrienne Wong!). WCHS is an inner city school that is populated with a diverse, wildly curious and bright group of humans. The drama kids at WCHS, ever inspired by the spirit of Betty Mitchell, strive to create our own pocket of radical artistic thought and action in our school. Ms. G: Okay, so can everyone say their name? Ms. G: The world wants to know – what blew your mind this year in theatre? Everyone answers at once: The High Performance Rodeo/Mouthpiece/The synchronicity of it was amazing/The passion behind the words/Brotherhood/Oh- I loved Da Kink in My Hair. Ms. G: Why do you think some people don’t go on in theatre? People who may want to as kids? Davina: Although I am not going on into theatre, I want to keep participating in it as an audience member. As a kid, my mom always told me there are no jobs in theatre and not to go on in that life, which is maybe more true back home than in Canada. In Canada there are lot more opportunities in theatre. Jaquie: I am kinda the same because I was told I would not have a solid job or make a lot. So I am going into education and minoring in theatre. Then I can still have it in my life. Grace: What’s wrong with not having a lot of money? I guess it depends on the person. I don’t care, I mean, it is only one part of my life. I don’t mind if I don’t have the best things. But I guess it depends on the person? What they need? Shaurya: Other professions are easier to maintain. I want to become a doctor and that is easier financially in the sense that I will have a job. In drama, you can go years without working as an actual actor. Davina: Also it can depend on how you were brought up. I have a single mom who struggled, and I remember when she was out of a job and it was really, really hard. And she has two jobs now, but it is still hard to have enough even when she has work. So, being unsure of when I will work next is not something I want to worry about, especially if I have a family. Jane: I feel lucky to come from a place of privilege and choosing theatre is scary because of the lack of financial stability. But the lucky thing I’ve had is to be able to meet lots of artists and hear about how they do it. So, that has been really inspiring because it makes me believe I can do it. And it will be hard, but I feel like this is what I have to do with my life. Grace: I had it set in my mind that visual arts was all I wanted to do, but I came to this school and joined drama and it really opened up my world. I am still going to school for visual arts but I really don’t want to limit myself as an artist anymore. I realize now I can incorporate so many different things into visual art like movement. You can have a lot of things. Theatre has helped me with that. Ms. G: Who is inspiring you these days? Who is keeping you going? Davina: I am really inspired by this kid at U of C, Connor, who I met at the High Performance Rodeo and he gave me lots of ideas of how to keep creativity in my life which has really helped me out. He is really comfortable just being himself. I think that is amazing. Jane: Karen Hines is really important to me right now. There is something about the soul of her work that speaks to my soul. I love her ideas and looking at her heart in her work. She is so raw and honest. Arman: I really loved Brotherhood and Sébastien Hines. I loved hearing about his thought process. And Judith Thompson. I love her work. Working with her words has been so incredible. Trent: My aunt and uncle work with Cowtown Opera. They inspire me because they have their own jobs and it doesn’t stop them from doing work with Cowtown Opera. They can still be actors. Shaurya: Sébastien Hines for me was so easy to relate to – his upbringing was so relatable to me. I really loved his show. I wish we could have spent more time listening to him because he was so smart and had such cool things to say about theatre and how he sees it. Layla: Anyone doing work with teens and not because I don’t think we are understood, but because I thnk people are afraid of us. We care and we are not scary. We have a lot to offer. We can make theatre too – we can do this and we have something to say. Grace: Andy Moro and Tara Beagan. I met up with them to talk about set design and that was really inspiring for me. And the creators of Mouthpiece. And you guys [the class] – being away from you while I was sick was hard. You guys are inspiring to me and this space is inspiring to me. Ava: I think that a theatre I love a lot and expect a lot from is Vertigo Theatre and want to see do cool things. I love murder mystery and have since I was a kid, I’m all about Agatha Christie. I think a theatre that focuses on one genre is hard and amazing and I want to see them go forward and do well. Haylee: Someone I’ve been finding inspiring and encouraging is Montsy Videla [graduated from WCHS in 2016, currently studying theatre at SFU]. She is the best young actor I know and she has found her way at University even though she may have setbacks. She is a great example of that idea of going after what you love, but being open to change. I take a lot of inspiration from that. Ms. G: What kind of work excites you? What do you want to make? Jane: I saw a show a little while ago called Mess. I was like, “thank you, thank you.” I am familiar with the subject matter. I reminded that I want to make theatre to heal. There was this gorgeous clown element to it. I just walked out feeling good and yet it was so dark in its own way. I think it just got to the heart of it so well. Haylee: Good theatre about mental health in general. Things like depression and eating disorders have been romanticized, especially on TV. It’s ugly, it’s not easy. I like to see the ugly, the realness. Ava: The High Performance Rodeo All’s Well that Ends Well. That show got me going. It is important to see Queer representation in the show. There was a Queer relationship that was not completely defined but lived in the show in really great way. I love to see elements of Shakespeare’s real life bleed into the work. Jane: I want to make art that is for the audience. Not for myself. I saw a show recently and walked out thinking this is a show that was all about “look at how smart I am, look at me.” With Shakespeare it feels so easy to walk out and feel stupid – I think that is a real danger. I walked out of All’s Well That Ends Well and felt really good, I got it. Ms. G: Cool, thanks everyone. It is good to hear from you. Tune in next edition as the Western Canada High School Theatre Class takeover continues on CdnTimes. Western Canada High School Drama program is a nationally recognized drama program that teaches radical and emerging young artists in grade 10-12 in Calgary, AB and has done so for over 60 years. WCHS is a inner school with a diverse and phenomenal population of students.